Two new sub-analyses from the IN.PACT Global Study of the IN.PACT Admiral in patients with peripheral artery disease have been reported at the annual 2017 Charing Cross Symposium (CX) in London, UK, one of the world’s largest educational meetings specialising in vascular and endovascular disease management. In a “Podium First” presentation at the conference, Gary Ansel, system medical director for Vascular Services at OhioHealth Riverside Methodist Hospital in Columbus, USA, presented one-year results analysing outcomes in patients from the IN.PACT Global study with complex lesions. The analysis compared standard usage patients (n=281) who met similar inclusion criteria for the IN.PACT Superficial Femoral Artery pivotal trial, an investigational device exemption (IDE) study, compared with use in a broader spectrum of patients (n=1125) who had wider inclusion criteria reflecting more real-world patients. Results in both groups demonstrated consistent and positive outcomes with IN.PACT Admiral at one year. 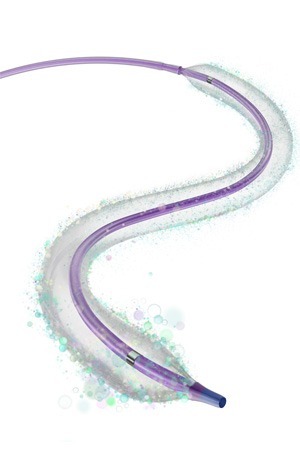 In the standard IN.PACT Global study group, clinically-driven target lesion revascularisation (CD-TLR) was 3.4%, which was comparable to 2.4% in a similar population in the IN.PACT Superficial Femoral Artery pivotal trial. CD-TLR for the group with complex lesions was 8.5%, despite the disease complexity observed in these patient types. These results were also consistent with the full clinical cohort for the IN.PACT Global Study (n=1406), in which one-year CD-TLR was 7.5%. Results of the primary safety endpoint were generally consistent across the cohorts and no safety signals were observed. Additionally, Fabrizio Fanelli, professor of radiology at the Sapienza University in Rome, Italy, shared results of a new subset analysis of patients with complex, calcified lesions from the long lesion and chronic total occlusion imaging cohort of the IN.PACT Global Study. The analysis included long lesion and chronic total occlusion patients defined as having moderately severe or severely calcified lesions (n=72). Calcium levels were assessed by the site according to protocol and confirmed by core laboratory assessment. At one year, patients achieved primary patency rates of 88.8 percent as calculated by Kaplan-Meier analysis. Primary patency is the ability for the treated artery to remain open over time. The analysis also demonstrated a CD-TLR rate of 8.5%. Consistent with other data sets, no safety signals were observed. In 51.4% of subjects, provisional stenting occurred.